Between school parties and hours of trick-or-treating, your kids have likely returned home with bright orange pumpkins filled with sweet treats this Halloween. While your kids (and you!) can enjoy a few pieces of candy over the coming weeks, they’ll almost certainly have a lot of leftover candy. Contrary to your little one’s belief, not all of their candy needs to be eaten immediately. In fact, Halloween candy can be repurposed for baking, learning and more. Continue the Halloween celebration with your kids by jumping into one of these fun ways to reuse their candy. Not only does donating candy rid your household of excess sugar, it also teaches your kids the importance of giving back. Operation Shoebox sends candy to service members overseas on a year-round basis. Following Halloween is National Gratitude Month, which is the perfect time to get involved and donate your extra treats to a great cause. Have your kids create a “Thank You for Your Service” card to include with their donation! If you are looking for something a bit more local, most Ronald McDonald House Charities collect Halloween candy for the children and families residing in their homes during Halloween time. You can also give away some of your leftover candy to retirement or nursing homes to provide a variety of sweet treats to the residents. And while homeless shelters or soup kitchens normally prefer food donations, treats during the holidays are also appreciated. Candy is a great counting tool and can be particularly helpful for a visual learner when they’re first learning addition and subtraction. Older children can use leftover Halloween candy to practice measurements and more advanced arithmetic. Science experiments are always exciting and engaging for kids, especially when involving candy. From creating a Pop Rocks balloon expander to setting up a density rainbow, your kids will love learning science concepts using materials in your own kitchen (with your help and supervision, of course). For younger kids, you can even set up a candy bar taste test that incorporates all five senses. This experiment allows your kids to evaluate the similarities and differences of the candies they’ve collected. Get creative with your kids by using leftover Halloween candy for crafts! Utilize the dye in colorful candies like Skittles or Jolly Ranchers to make a DIY candy watercolor set for your family’s next art project. Let the candies soak in water, and watch as the dye creates a wonderful array of colors. Your kids will love painting with these familiar materials and will enjoy the thrill of having scented watercolors. With Thanksgiving right around the corner, have your kids repurpose their Halloween candy by decorating turkeys and other festive crafts. Create a candy corn handprint turkey to display for family and friends in November. Or try making some turkey treats to decorate your living space for the upcoming holiday. Gobble, gobble! Get ready for cookie swaps and countless holiday parties. Excess M&Ms and Hershey’s Kisses can be saved for the upcoming holiday seasons and used to make festive chocolate pretzels. Reese’s Peanut Butter Cups can easily replace chocolate chips in oatmeal chocolate chip cookies. These cookies are a great way to spread some holiday cheer! If baking isn’t your scene, try adding a bit of chocolate-based candies to sweeten up some homemade granola or trail mix. Both granola and trail mix can be added as a topping to Greek yogurt, a bowl of fresh fruit or our Blackberry, Apple & Chia Puree as an afternoon snack. To help prevent dental cavities, dentists nationwide will participate in the Halloween Candy Buyback Program, which allows you to trade in candy in exchange for a set rate per pound. This candy is then distributed to troops overseas with dental hygiene products via Soldiers’ Angels. You can even organize a buy-back “program” in your family, where you offer to pay for pieces of Halloween candy from your kids. Use this as a time to teach older kids about saving money and financial goals. If you have some extra freezer-space available, freezing chocolate candies prevents them from melting and extends their shelf life. By having these treats in storage, they can be turned into an ice-cream topping for special occasions or for future baking. It’s also always convenient to have a supply of candy on hand for other holidays. 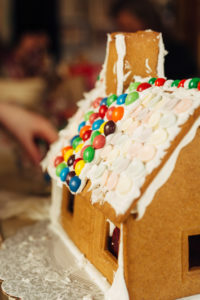 One of the most popular holiday traditions is decorating gingerbread houses with icing and candy. Storing leftover Halloween candy saves both time and money on having to buy a whole new batch for family-friendly activities. Chocolate candy can be added to low-fat milk or a milk-alternative in order to whip up a special cup of hot chocolate to keep your little ones warm during the holiday season. Start by combining your chocolate candy and milk in a saucepan. Whisk together until the chocolate melts, then pour into glasses, add a little more milk and stir! Too many treats can be tricky! After having your kids pick 10-15 pieces of candy to enjoy over the week, get started on one of these ideas to continue the holiday. Crafts, donations and buy-back programs are just some of the ways to reuse your kid’s Halloween candy so they don’t over-indulge in treats. Or, simply elongate the fun by saving Halloween candy to enjoy through the upcoming holiday season. Jennifer’s work at Nurture Life is focused on marketing, customer experience and business development. Prior to Nurture Life, Jennifer spent 17 years in the tech industry, most recently as vice president of marketing at Engine Yard, a high-growth, cloud technology startup. She previously ran marketing at a media software company and cleantech startup. Jennifer has also worked in marketing and product management at the two largest business software companies SAP and Oracle Corporation. Jennifer received her B.S. in Economics and MBA from The Wharton School of the University of Pennsylvania. Jennifer is the mother of two incredibly loving, energetic, enthusiastic boys and loves spending time taking them to local parks, chasing them around their home and cooking with them.